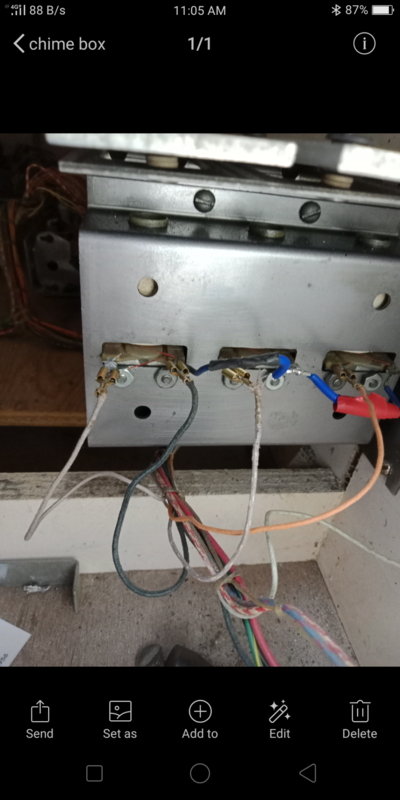 Hey was hoping someone could show me a picture of a properly wired chime box for a Captain Fantastic. 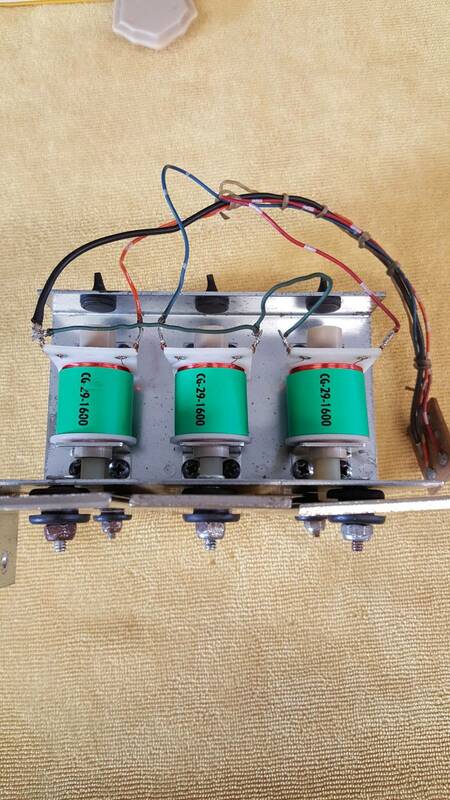 Mine had the box with no solenoids so I am not sure what goes where. I have a wiring diagram but am unsure if there is a positive and neg side of the coils or if it matters. Maybe this post from my Bon Voyage thread might help a bit, those are Ballys of very similar vintage and I would guess the chime boxes are similar. 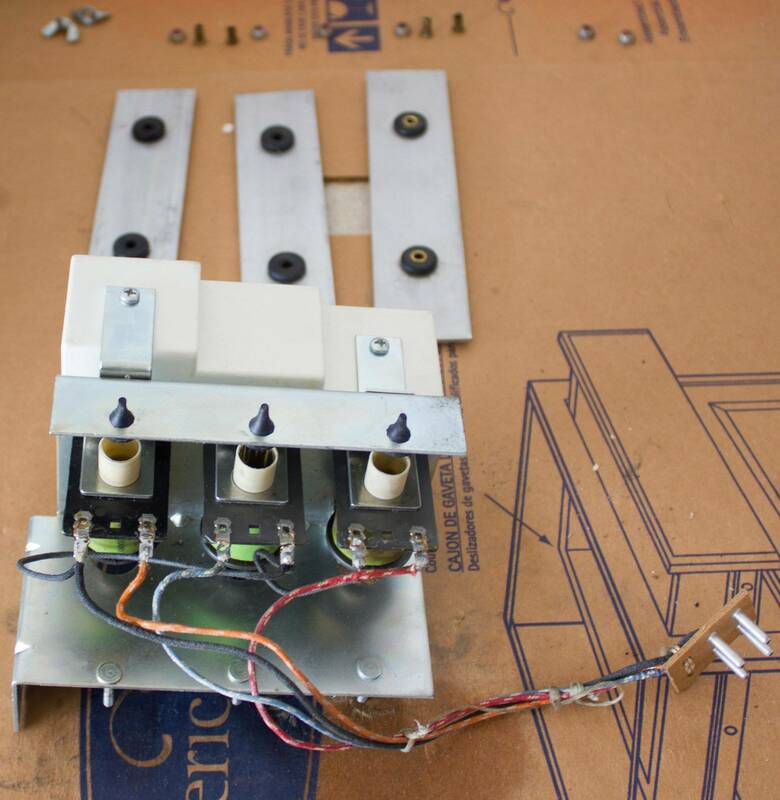 There's a pic of the chime box there that shows the solenoids and wiring pretty well. Now having looked at this more closely, I find myself confused!!! I have brought over the pic of the Bon Voyage chime box, here it is. In the pic the BLU-W wire which is presumably for 10 points is the middle chime. Seems like it should be the shortest one? The O-W wire which is presumably for 100 points is on the tallest chime. The other solenoid has a R-W wire, not G-B. Not sure what is going on there. Error in the schematic? Someone swapped it? So it should be easy to wire it up, except now I am confused as to the pairings of the solenoids and the chimes. I would have thought it would go like this but my BV is not set up that way. Well here's how I got it wired now it seems to work but I just wanted to make sure it looks very close to what you posted. Williams Triple Strike has the chimes wired from small to large: 100, 10, 1000, so it seems reasonable that Bally might do something similar. Unless you're worried about authenticity, it probably doesn't matter which chime rings for which point value as long as you like the sound. These should all be AC coils, so there is no positive or negative to worry about. Ok cool thx for the info! 10 points is the short chime, which as you can see has a R-W wire. 100 points is the medium chime, it has a BLU-W wire. 1000 points is the long chime, it has a O-W wire. The wire colors on the adjustment plug all match up with the ones on the main board that it plugs into. So basically the schematic is completely goofy. I have found several other errors in the BV schematic so this doesn't surprise me. It is some sloppiness/laziness going way back to when these were documented and built. It would be interesting to see other BV wiring to see if it matches with mine. The important thing is yes as Billc said, the chimes are wired smallest to largest by point score smallest to largest. Makes sense. This might help you.There are three coils they are joined to each other by the right lug of each coil. The first coil on the left is were the main power is connected to and its the the right lug.